What Mech get's thrown from all the bars and the ladies room? "I don't feel good, Mr. Stark!" Oh no!!!! There goes the Spider Mech!
" Nothing stops the Juggernaut! You shouldn't have enter the ring little spider! MUHawhawhawhaw... "
Who always wanted by the law and who is always chasing them? What mech never gets lost? I never thought of that one. Awesome. What do you get when Quickdraw, Gunslinger, a Clint, and Rifleman fight? Old space Western shoot out! What do you get when an Enforcer & Clint team up. A specular new Dirty Harry movie! A whitworth walks into a bar. Its leg falls off. Okay, that one really was funny. What do Crabs call King Crabs? What did the Crabs institute after that? What do you call a one-legged Hussar? What do you call a UM-R60 that spends all its time in the residential district? A call was sent out to all other Clans by a Jade Falcon mechwarrior, who claimed to have made the next major leap in Clan society. 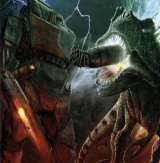 They were to meet on a specified planet with a mech of their choice and a prime example of their Clan's totem animal. Nothing else was said. A mechwarrior from Clan Ice Hellion arrived first with an ice hellion perched on her arm to match the bird on the other's. "What have you called us here for? ", she asked. "I have made a breakthrough in mech combat," said the Jade Falcon mechwarrior. "It is so simple that I can't believe we've never considered it before. If we were to simply keep our totem animal with us in our cockpit as we fight, the pride we feel in our Clan would surely cause us to fight with unprecedented ferocity!" The Ice Hellion mechwarrior looked at her totem animal and smiled. "I suppose it would. In fact, I wish to experience this for myself." "Then we will enter our mechs and engage each other in zellbrigen, and you will come to understand what I now know is the truth." The two dueled, and with the feeling of closeness to their totem animals fought with unparalleled bravery. After the mech of the Ice Hellion pilot had its arm destroyed by a well placed particle beam shot, the Jade Falcon pilot offered hegira and it was done. "That was an incredible duel," admitted the defeated pilot. "I will recommend this method to the rest of my Clan." Just then a dropship landed, and a member of Clan Star Adder walked out and addressed the one who called them, "what have we been called for?" "I was just showing my friend here the satisfaction of fighting with our totem animal by our side. Do you accept my truth? The Star Adder mechwarrior looked at the damaged mechs, and then at the Ice Hellion pilot and saw that she was adequately convinced. "Sounds simple enough. In fact, my cold-blooded friend might even enjoy the heat of a mech's cockpit." More dropships began to land. Cloud Cobra, Snow Raven, Steel Viper. All of them dueled each other and came to see the truth. "I don't know why we never tried this sooner! ", one exclaimed. "Here comes someone from Clan Diamond Shark."